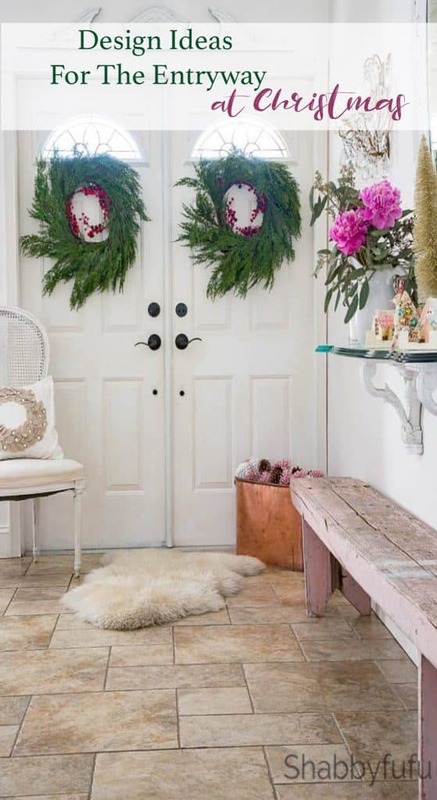 Design ideas for the entryway at Christmas and I’m sharing the entryway of my home decorated for Christmas today! I’m not really sure why I don’t share this area much because when I fluff it up a bit it does reflect my Romantic French country style pretty well. Come on in…literally, as I’m sharing a few tips! Sponsored by Kirklands. Entryways or foyers (as more formally known) set the tone for those who ENTER our home. Where I live in South Florida mudrooms or back door entries are not a thing, so you have one shot at making it look good. When we first came to look at our home as a possible place to raise our young daughters we were far from impressed. Going back 27 years ago to first impressions they were dismal, dark and dreary and I just wish that I had photos to share. Maybe not though, as the flooring was pretty disgusting (brown shag carpet), the entryway wall was covered in flocked wallpaper and the wood carved doors were painted dark brown and in rough shape. Can you imagine? Bleck! But this house was a true diamond in the rough and we loved how when you opened the front doors you would see clear to the pool and beyond to the garden. We were sold. By an entryway. Challenge accepted to make this fixer upper our permanent home base. The first thing that we did after ripping out the flooring and replacing and stripping the wallpaper was to decide on the purpose that an entryway should provide. No coat closets necessary in my area, so no place to store stuff means it needs to just be practical for heading in and out. We put up the console that I custom designed with waterfall ogee edge glass to give an open feeling. The brackets I had purchased on-line and painted them white and they are made of a heavy duty cast material so are toggle bolted into the wall. I really prefer to have a wall mounted console table so that floor space isn’t taken up. For Christmas it’s always decorated with some sort of vignette! The mirror is an antique carved pier mirror from an estate sale years back and back in my “let’s paint everything white” days I went at it hard! 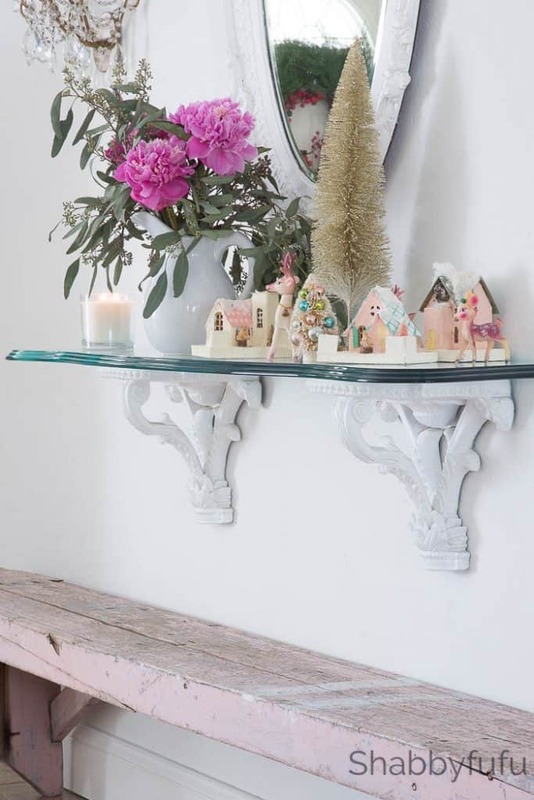 A mirror is ESSENTIAL in a FRONT ENTRYWAY to do a last minute check before heading out the door. 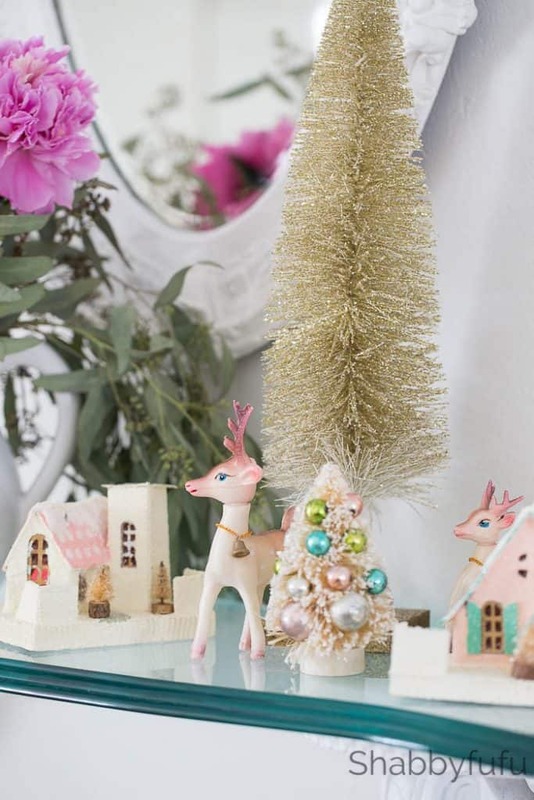 Every year I do it different for Christmas and this year it’s some of my pastel Christmas cottages, bottlebrush trees and vintage reindeer. 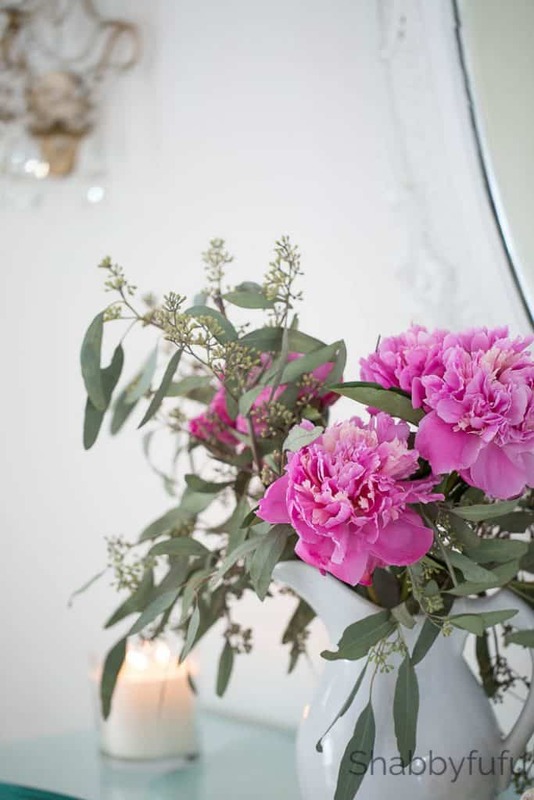 Fresh peonies are available here now and you can bet that I’ll always have a peony bouquet or two in my home until they are no longer available! I love the SCENT and GLOW of a fragranced candle and the COZY CASHMERE CANDLE from Kirklands simply SMELLS LIKE CHRISTMAS! As much as I love fresh green wreaths at Christmas they just aren’t very practical and faux is the way to go! These CEDAR AND PINECONE WREATHS from Kirklands are gorgeous and there is none of the mess that there would be if they were real. Kirklands has lots of affordable home decor items at great price-points and if something is sold out on-line you can check the box to be notified if the item comes back into stock. A place to sit and put on/ take off shoes is a must have for a truly functional entryway and why not make it a French chair! 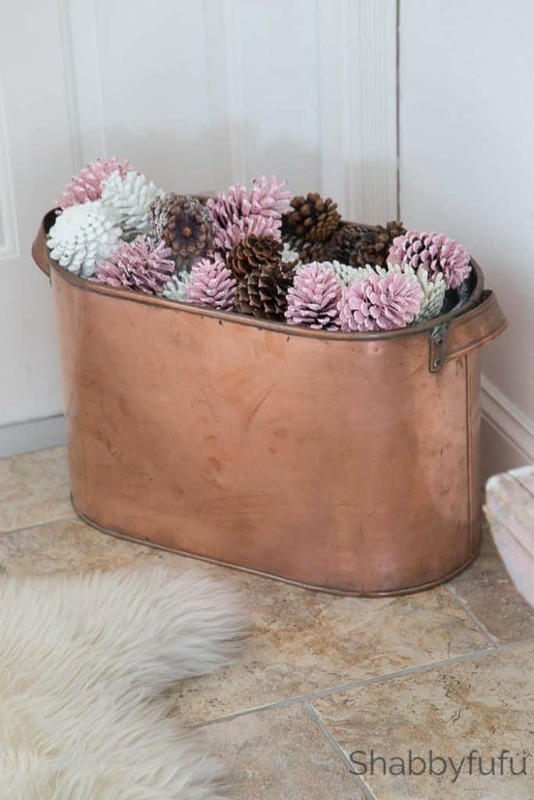 This copper bucket is filled with pinecones for the holiday season and off season/rainy season it holds umbrellas. *TIP* Stuff a bucket with crushed newspaper first and set your pinecones on top of your bucket (fewer pinecones needed). I have tips on the PAINTING PINECONES and some other Pinecone projects if you need some ideas. 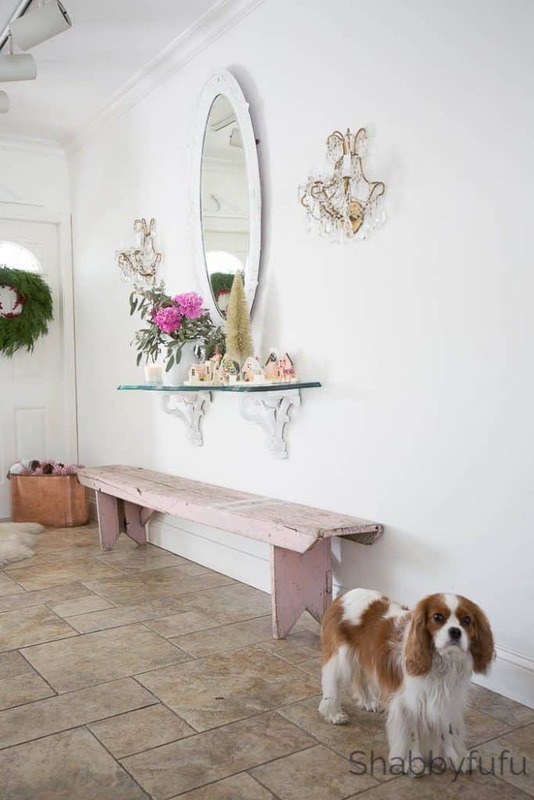 For more IDEAS FOR BEAUTIFUL ENTRYWAYS find them HERE. Some lighting and a bench for the dog leashes and packages and we are set. Just a few decorative items for Christmas from sponsor Kirklands makes it so festive and merry for all. I’ll be sharing more from my sponsor Kirklands soon!